My assumptions are probably wrong, but this is what I was thinking of. Due to human skin having some capacitance, when one would touch the plate, there would be some current flow due to change in capacitance. High pass RC filter would get rid off DC offset and the signal would get amplified by LM358. This would then trigger 555 timer in monostable mode. Any help is greately appreciated! If you're really after a capacitive touch sensor, this likely won't work at all because the aluminum plate is a short to ground. You're better off making an oscillator (ring or 555 based oscillator's are my favorites) that has a frequency based on R and C where C is two separate contacts where the touch sensor goes. A persons finger near the two contacts greatly changes the dielectric between the two contacts and you end up with a very different capacitance. With a different capacitance, you now have two different frequencies that your oscillator will ring at. It's actually a range of frequencies depending on how close the finger is, but that will be turned digital at the end. Then you send the oscillator output into a high pass filter (small capacitor in series), set the DC operating point and then use a comparator with a chosen voltage level to determine whether the person's finger touched it or not. There's always digital versions if you wanted to travel into uController land. 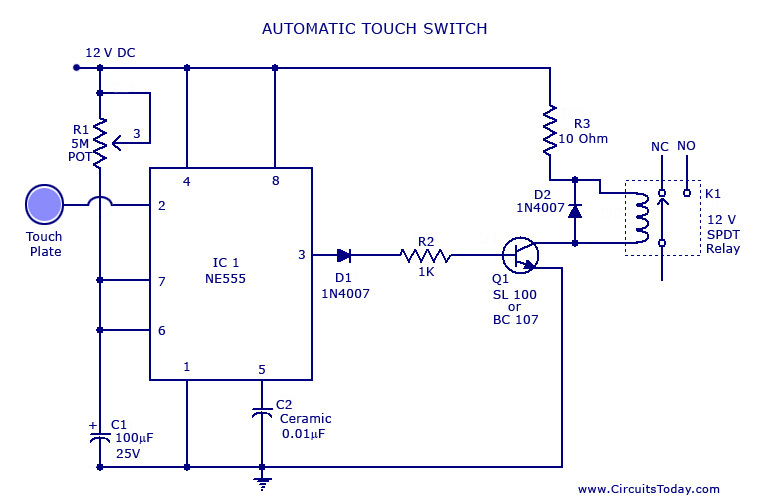 Here's an app note by TI on capacitive touch sensors. A lot of the front-end concepts are the same regardless of whether you want to go digital immediately or just keep it analog until the end as I described above. The downside to this version is that if your plate is too big, it can act as an antenna and the output will be very unstable. Additional circuitry can be used to filter out the noise if desired. Not the answer you're looking for? Browse other questions tagged operational-amplifier touch-panel or ask your own question.